Over the course of the next 5 days, you are going to learn how to tap into one of the largest sources of traffic online today, Twitter. Twitter is among the fastest growing social networks and is also one of the most widely used websites on the entire Internet. The potential for marketers to find hot prospects for ANY market has never been so readily available! With Twitter, any person can tap into a global conversation, in real time and directly engage with any person who is talking about a topic that they are interested in. Having said all of that, I don’t really need to spend any more time selling you on the concept of Twitter. You bought this product so you are already sold. Let’s dive right into what you will be learning. Evaluating and choosing Twitter clients that meet your needs. * Day 1 is a one time set of exercises. 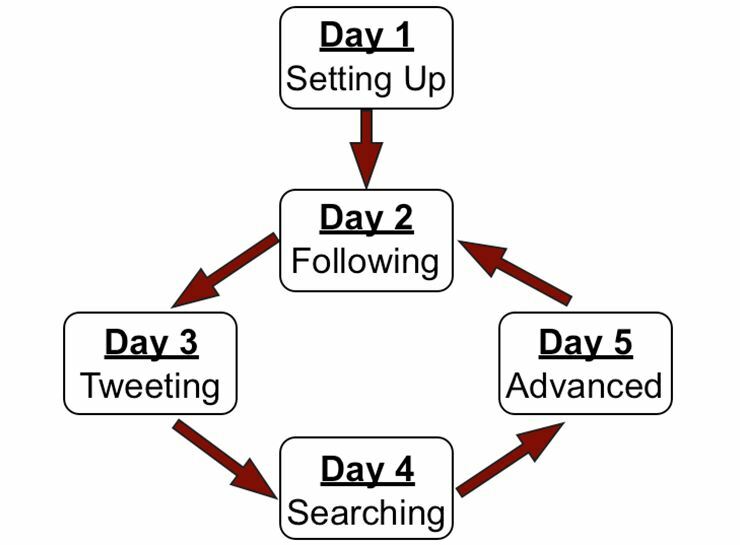 Once you have completed Day 1, you will not have to repeat any of these steps in order to use Twitter effectively. You will, however, want to revisit Day 1 every once in a while to make sure your profile remains up to date. While Day 1 was a stand alone lesson, Days 2 through 5 can be seen more as an accumulation of knowledge and expertise. Each day will build on the previous day and these 4 lessons should be repeated over and over again as you develop your Twitter skill set.